Google has a built in feature that lets you set a classroom timer in your Omnibox (the address bar in the Chrome browser where you type in a site URL). If you want to set a timer for 30 minutes you just need to type: set timer for 30 minutes. (see example below). 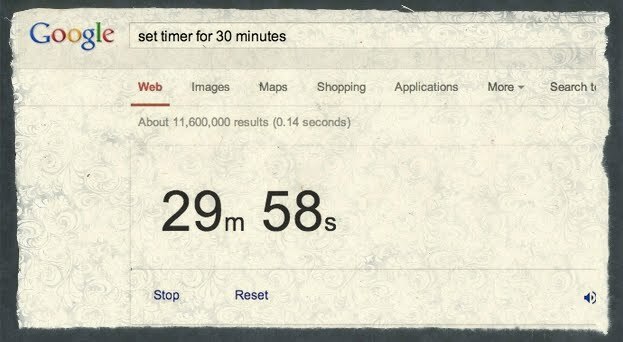 Google search will then set a 30 minute timer which includes a nice little animation. It also has the countdown, stop, and reset buttons. The alarm is set to go off by default, but you have the option to turn off the alarm by clicking on the speaker icon in the lower right hand corner. If you close the tab in Chrome the timer will stop, but you will get a pop up confirmation box letting you know that closing the tab will stop the timer.